QTranslate Portable is a simple program which allows you to translate text between languages by connecting to online services including Google Translate, Bing Translate, Prompt, Babylon and others. You can use the application in most Windows applications which allow you to select text while also being able to insert translations quickly through a couple of clicks. QTranslate can also translate text in its dedicated interface and is only limited by the number of languages the online services it relies on support. 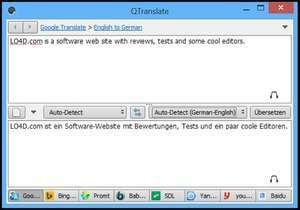 QTranslate Portable can automatically detect the language you have input into the text box, or if preferred, the language translation pair can be selected manually. Version 6.7.2 is a freeware program which does not have restrictions and it's free so it doesn't cost anything. For security reasons, you should also check out the QTranslate Portable download at LO4D.com which includes virus and malware tests. Additional screenshots of this application download may be available, too. These applications typically translate between 2 or more languages. Editors provide links to download and also offer up reviews for popular software programs. Check out some of the freeware downloads available in the translator category. They contain no strings and are available at zero cost.